Oscar Cocktails are inspired by this year's nominees for the Academy Award for Best Picture. See recipes for all of this year's Oscar Cocktails here. Brooklyn, adapted from the historical novel by Colm Tóibín, is the story of Eilis Lacey (Saoirse Ronan), a young Irish woman who immigrates to the United States in the early 1950s. There, she begins a new life in Brooklyn, falling in love with a young Italian man, Tony Fiorello (Emory Cohen). The film is nominated for three Academy Awards including Best Picture and Actress (Ronan). The basis for the Brooklyn cocktail was really obvious: the Brooklyn cocktail. It's a classic cocktail that's a riff on another classic--the Manhattan. While both drinks are made with rye whiskey and bitters, instead of the Manhattan's sweet vermouth, a Brooklyn calls for dry vermouth and, for sweetness, maraschino liqueur. To make the drink fit with the film, I used particular ingredients to represent the geography of the characters and setting. For Eilis's Irish heritage, I used Irish whiskey instead of an American rye whiskey. Tony's Italian heritage is represented by Luxardo maraschino liqueur and Carpano dry vermouth, both of which are made in Italy. Then Brooklyn itself is represented by the bitters. I used a blend of aromatic and orange bitters from Hella Bitters, which was founded in Brooklyn. 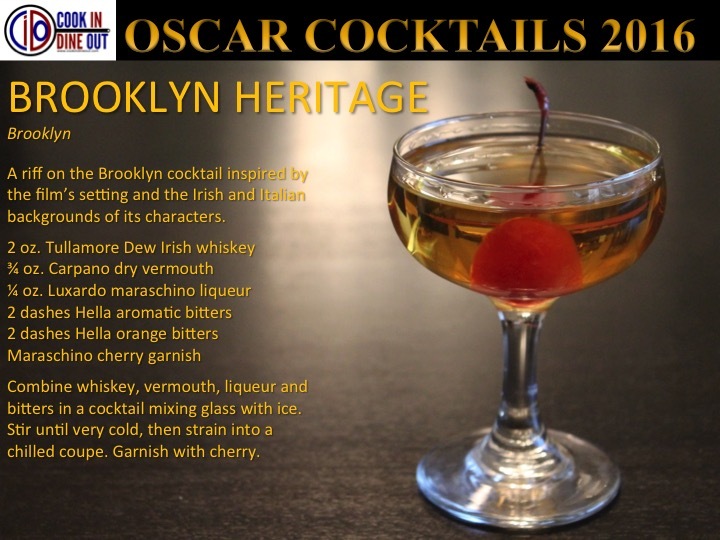 A riff on the Brooklyn cocktail inspired by the film’s setting and the Irish and Italian backgrounds of its characters. Combine whiskey, vermouth, liqueur and bitters in a cocktail mixing glass with ice. Stir until very cold, then strain into a chilled coupe. Garnish with cherry.